This morning, while showering, it suddenly occurred to me that this month, perhaps even this week, marks the sixtieth year since I joined the famous and well-respected Reuters news agency as an office dogsbody. Sixty years! They seemed to have flashed by, a phenomenon familiar to anyone of my vintage. And I remember my first day at Reuters as if it were yesterday, even the face of the rather dour doorman who told me to use the stairs instead of the lift – “lifts are for important people” – as I made my way to the second-floor newsroom. I was under no illusions about my lowly status, but my humiliation that day etched that doorman’s face in my memory for six decades. I would recognize him if I met him on the street, although it must be doubted that he is still alive. Actually, I had not joined Reuters but an outfit called Cometlburo, an agency that specialized in reporting stock and commodity prices from around the world, and which Reuters had acquired just before the Second World War. Comtelburo’s business was somewhat arcane, not to mention laughable, specializing in a diverse range of obscure commodities from hemp to sugar beet. Such activities were scorned by the general news reporters up on the fourth floor as surplus to requirements. They dealt in ‘real’ news – war, politics, natural disasters and other world events destined for the front pages of the British and Commonwealth newspapers, which then owned the company as a cooperative. “Italy has just formed its 45th post-war government,” one old editorial hand famously scoffed in print. “No room for your crap.” What he overlooked was that reporting new Italian governments made no money, whereas Comtelburo’s operations, however mysterious, actually did. Not much, mind, but enough to keep the whole enterprise afloat, or at least enough to avoid going to the owners for increased subscriptions that they could hardly afford. What neither he nor anyone else in the agency – management included – realized at the time was that in the mysterious works of Comtelburo – later renamed Reuters Economic Services – lay the beginning of the agency’s revival and transformation into a highly profitable electronic purveyor of market data – at a time when markets, having recovered from wartime disruptions, were starting to play a prominent role in the world economy. Reuters would make a fortune from it. My early role in the agency – mainly fetching tea and cheese and pickle sandwiches for perpetually thirsty and often hungry floor managers –was later replaced by that of journalist, editor and, towards the end of my Reuters career, as a revenue-generating manager. I left the company some years after it had dispatched me to New York, when I accepted a job offer from Telerate, a small American-owned company and putative rival to my alma mater. I missed out on the financial bonanza my former colleagues enjoyed when Reuters went public, but by then Telerate itself had issued public shares and I enjoyed a windfall from that – sufficiently large that I have scarcely done an honest day’s work ever since. 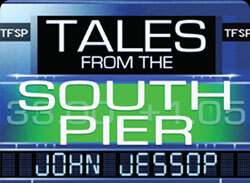 I mention this – all of which is recounted in greater detail in my published memoir, Tales from the South Pier, because my experiences at Reuters remain dear to my heart. I joined as a seventeen-year-old – rather young for my years, I have to say – and left as a seasoned management figure, one with sufficient stature to command the attention of business rivals. More importantly, I learned everything I know about business and politics from Reuters – and much else besides. Actually, the agency taught me nothing; there was no mechanism for teaching anything. What it provided was an environment in which I could learn a great deal, if only by some mysterious osmotic process. In my case that was just about everything. I had left school – which I hated – at sixteen with nothing to show for it, most conspicuously the lack of a university education. Reuters, in the event, would become my university, its managers and editors my unwitting tutors. I am not the first, and will not be the last person, to be molded by, or to become a creature of, the company that provided a career – and in my case a great deal of fun –nor will I be the last. But such experiences are no longer as commonplace as they used to be in an age where ‘focus’ and ‘process’ seem to dominate everything. For everything that Reuters provided in shaping my life, indeed my personality, I remain grateful. Finally, a shameless plug: do read the book if you have found this remotely interesting. The book’s cover blurb says it is a ‘riveting read’. And so it must be since I wrote the blurb myself.